The Nikon D5 will keep pros happy with its great burst-shooting and low-light performance, but a couple of niggling build issues mean it isn't as convincing an upgrade over the D4S as it could have been. 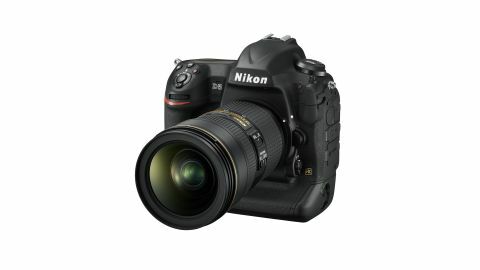 In November 2015 Nikon announced that the D5 was in development to replace the D4S, the company's flagship SLR aimed at professional photojournalists and sports photographers. With the Olympic games arriving this summer it was odds-on that we'd see something concrete at CE in January, and sure enough Nikon obliged, revealing its new 20.8MP full-frame model at the show in Las Vegas. Few at the press conference could claim not to be surprised by the new camera's top expanded sensitivity setting: ISO3,280,000 or a little over three million (actually, even 280,000 is quite a lot in ISO terms). This is something Canon hasn't matched with its new 1DX Mk II, which has a maximum expansion setting of ISO409,600, and it begs the obvious question: does ISO3,280,000 actually produce usable results? More on this later. While a maximum setting of ISO3,280,000 might attract the headlines, the real reason for this huge hike in sensitivity is the work that Nikon has done to improve image quality and noise control at the more commonly used settings, those within the native range of ISO100-102,400. According to Dirk Jasper, Product Manager for Nikon Europe, the main target area for improvement with the D5 was the ISO6400 to 12,800 range, as these values are most commonly demanded by professional sports and news photographers. Another feature that's incredibly important to the D5's target audience is the autofocus (AF) system, and Nikon has also upped the ante here, giving the new camera a 153-point system that has 99 cross-type sensors, with a central point that's sensitive down to -4EV. Of the 153 points, 55 or 15 are individually selectable – the rest are support points – and the cross-type points extend closer to the edges of the frame than in previous cameras. The system can be set to operate in single-point, 25-, 72- or 153-point dynamic-area AF, 3D tracking, group-area AF or auto-area AF mode. There's also a new ASIC (computer) unit that's dedicated to the AF system to ensure consistently high performance. The AF 'workflow' and tracking systems have also been improved, to better keep up with fast-moving subjects. Of course, a fast AF system needs to be paired with fast continuous shooting capability, and thanks to the EXPEED 5 processing engine the D5 can shoot at up to 12 frames per second (fps) with full autofocusing and metering capability. What's more, this can be maintained for up to 200 raw files when writing to an XQD card, giving plenty of scope for capturing Usain Bolt's exploits this summer. It's possible to push the continuous shooting rate to 14fps, but when this option is selected focus and exposure are fixed at the start of the shooting sequence. In addition, the mirror stays up from the moment the shutter release is fully depressed, so the viewfinder is blacked out. The ability to record 4K (3840 x 2160-pixel) video was expected for the D5, but surprisingly it's only capable of recording for a maximum of three minutes internally. While this will be sufficient in many situations, there will plenty of others where it'll be nowhere near enough, so the D5 is unlikely to be of interest to serious videographers. According to Nikon Pro magazine there will be a firmware update that will extend continuous recording to 29 minutes 59 seconds, the same as with Full HD recording, but it still hasn't materialised. Some better news about the 4K recording, however, is that it's possible to employ a native crop so there's no pixel binning, giving better image quality. There's also an HDMI output to enable connection to an external monitor. It's worth mentioning at this point that there are two varieties of the D5, one that has two CompactFlash (CF) card slots, and one that uses XQD cards. Those wanting the maximum burst depth will need to opt for the QXD model; according to Nikon the burst depth is cut roughly in half when writing to a CF card. Like the D500, the D5 has a 180,000-pixel RGB metering sensor, which also helps to inform the white balance, scene recognition and AF system. Anyone with a D4S will feel at home with the D5, as the control layout has been kept the same. The grips on the front and rear of the camera, however, are more ergonomically shaped to make it more comfortable to use for long periods of time. I certainly had no problems holding it for a few hours at a stretch during this test, although a monopod would be beneficial to take some of the weight when shooting with a large lens. Like the D4S, the D5 feels like it would be safe to use in the toughest of environments, having a full metal body and extensive weather sealing. There's even a weatherproof cover for the hotshoe, to keep the contacts dry when a flashgun isn't mounted – I experienced no problems when shooting in rainy conditions during this test. Although the D5's control arrangement is very familiar, it's not absolutely perfect. The mini-joystick sub-selector that's used to set the AF point when holding the vertical grip, for example, is more awkward to reach with your thumb than the one associated with the horizontal grip. And, while there are three buttons around the horizontal shutter release, there's only one by the vertical button. This means you have to adapt the way you control the camera depending on the orientation you're shooting in – it would be better if the vertical controls were the same as the horizontal grips, although this would require some remodelling of the memory card port area. While the D5's 3.2-inch 2,359,000-dot screen is touch-sensitive, it doesn't make much use of the touch control – it's only for scrolling through images and zooming in to check sharpness. It works intuitively with taps, swipes and pinch-zooming and responds promptly, but it's not possible to navigate the menu, make settings selections or set the AF point by touching the screen – it would be helpful if some of the settings displayed when pressing the Info button could be selected and adjusted with a tap. As I've suggested with other Nikon SLRs, it would also be helpful to combine the functions of the Info and 'i' button to streamline some of the control. As it stands, pressing the i button reveals a list of eight features that can be selected for adjustment; the list seems somewhat random, and contains items such as Color space and Custom control assignment, which are unlikely to be required on a frequent basis. Meanwhile, pressing the Info button activates a screen that looks like the Quick Menu of many other cameras, displaying an extensive collection of settings (including some that appear in the i button list), but none of these can be selected for adjustment. Not surprisingly given the high dot count of the screen, images look great on it, and it's easy to check sharpness. However, at the default setting I found it often made captured images look brighter than they are, so it's a good idea to keep an eye on the histogram view, and consider turning down the screen's illumination.